First, a few words on GPS: the GPS system is a set of satellites operated by the U.S. military that enables - provided you have a suitable receiver - to know your geographical position at any point of the globe with 1-3 m (3-10 feet) precision. But it gives only your longitude latitude: GPS does not replace the map. It just replaces the pen tip that shows where we are. You must therefore possess independently a map of the area. GPS is not the only means for positioning: it is possible to obtain a fairly accurate position in urban areas from cell-tower antennas and wifi hotspots using triangulation methods. The advantage is that localization is much faster in these dense areas where GPS satellites are often masked by buildings. Indeed, while most tablets and almost all smartphones have a real GPS, these devices are set by default to get their position primarily from WiFi / 3G signals. Which is a good thing : while connected to one of these networks, they take the opportunity to download the map of the area. Map: download it before leaving! 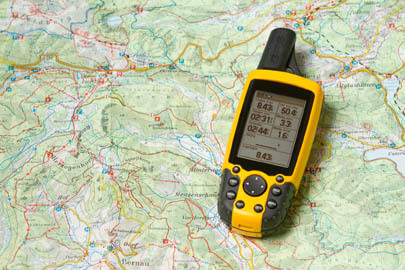 As we have seen above GPS is not enough, you also need a map. And there is no miracle: for a tablet to display something on its screen, it must be present in its memory. The card needs to have been already loaded if you want to see it with no network connection. - If the device's memory management decides without notice to remove this data to free up space. Losing a map can have serious consequences ! It is recommended to use an app that downloads real maps permanently in memory. - use a specialized application, capable to load and display specific maps for your activity : topographic map, marine chart, aerial map ..